Microsoft and Jamf explain how to best manage your hardware and software. The world runs on multiple devices. Users most likely have personal and corporate computers, phones and tablets, and now more than ever, they want an interconnected ecosystem experience across their technology. When you look at the enterprise, the two dominant, fastest growing ecosystems in business are Microsoft and Apple. 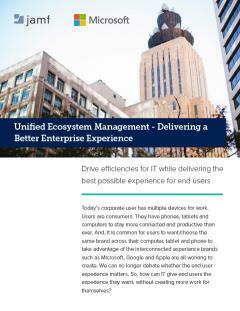 To manage and secure your organization while providing a great productivity experience, you need a management solution that is keeping up with each ecosystem and the modern workplace. Microsoft and Jamf, the solutions most customers use and love, are integrated to do just that.